Your bedroom is your private sanctuary as well as a place to catch up on your beauty sleep. 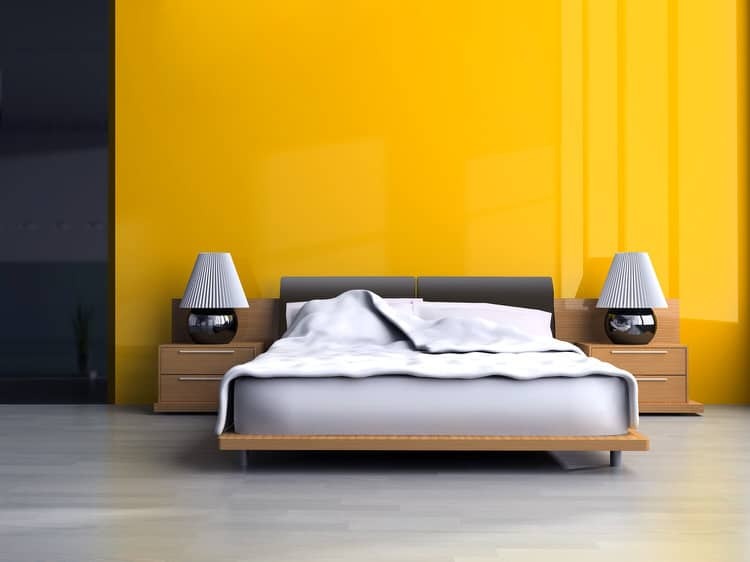 The colors you choose for your bedroom can affect the amount and quality of time you spend there. Whether you want rich and luxurious or bold and contemporary, creating your perfect bedroom can be as easy as zeroing in on a single color or color palette as inspiration. Draw inspiration from the colors right outside your bedroom window. The green color of lichen, the deep blues and grays in the sky are the colors that remind one of the deep woods. In this bedroom, walls painted in that mossy green create a neutral background while white trim and rich furnishings complete the classically natural palette. Brilliantly saturated yellow mixed just for this bedroom, brings the intensity of the morning sun to this SoHo apartment. This high gloss paint looks fabulous thanks to the quality of the product and the talent of the painter. 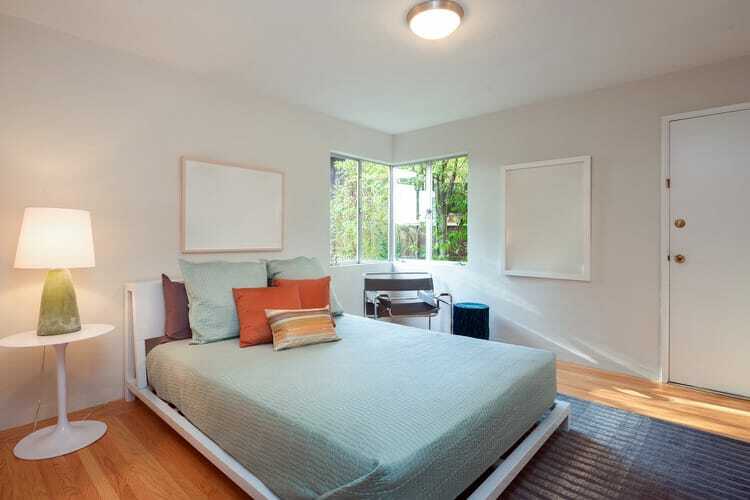 The only caveat when using this type of wall effect is make sure the room gets ample sunlight throughout the day. Otherwise the results will disappoint. Using a color like this rich, pumpkin might strike fear in all but the most intrepid decorators. But you can pull off the look too if you start on a small scale. Begin with a neutral room and add in a few coordinated accents like the delicious spicy-orange bedspreads, sheets and shams, a terra cotta area rug, and a curry-infused side table. 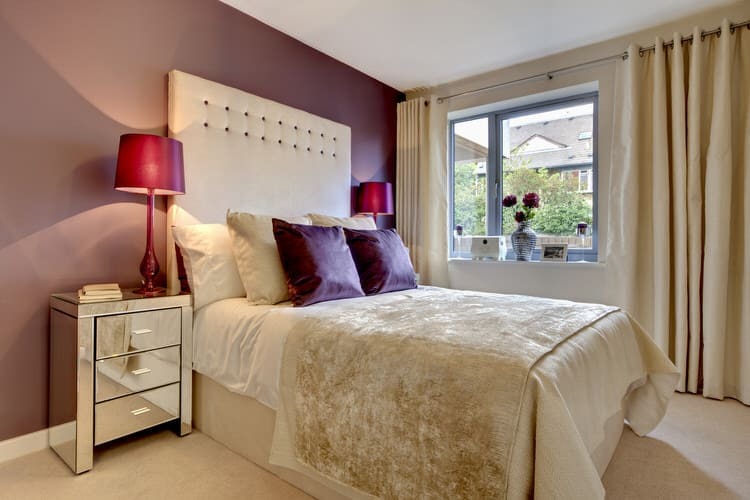 Create a romantic mood by adorning your bedroom in shades of wine, purple and ivory. Velvet textiles and window treatments add a textural and tactile element to the space. Balance the deep hues of the purple tones with ivory bedding. The creamy leather headboard creates just the right contrast against the rich plum feature wall. A simple black-and-white color palette looks anything but simple in this dramatic bedroom. Neutral colors and natural textures, such as the linen gauze canopy, soften the contrast of dark woods and black-and-white bed linens. 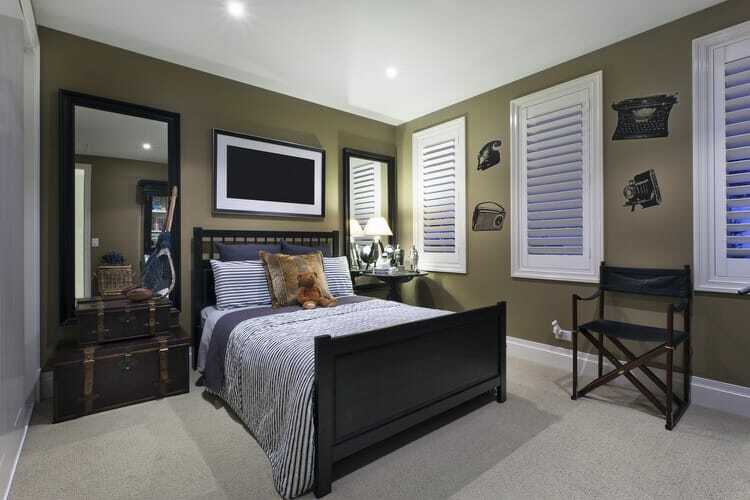 The subtle pairing light with dark is an effective way to add visual interest to any bedroom. Forget neutrals, a splash of color is what you need to revive your boringly beige bedroom. This fresh floral comforter features blocks of saturated teal, fuchsia and chartreuse to remind you of a summer day any time of the year. Contemporary furniture and accessories gives this bedding a decidedly chic feel. Use a combination of patterns in your bedroom without overwhelming by employing these designer tricks. Vary the scale of patterns in the room. Even though the bedspreads are patterned, the smaller print reads as a solid color. Look for common colors among the different patterns you use and you’ll end up with a look that is totally pulled together. 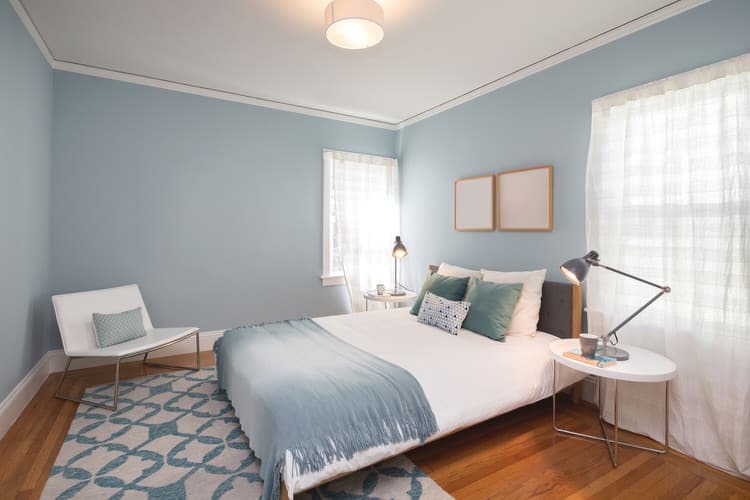 A neutral bedroom comes to life using various shades of blue. The damask patterned duvet, lamps and pillows set the color tone for the room, while the pale Tiffany blue walls tone down the intensity. The result is stately and serene. The designer of this bedroom used a color palette of deep, chocolatey browns to create a delectable and inviting bedroom. 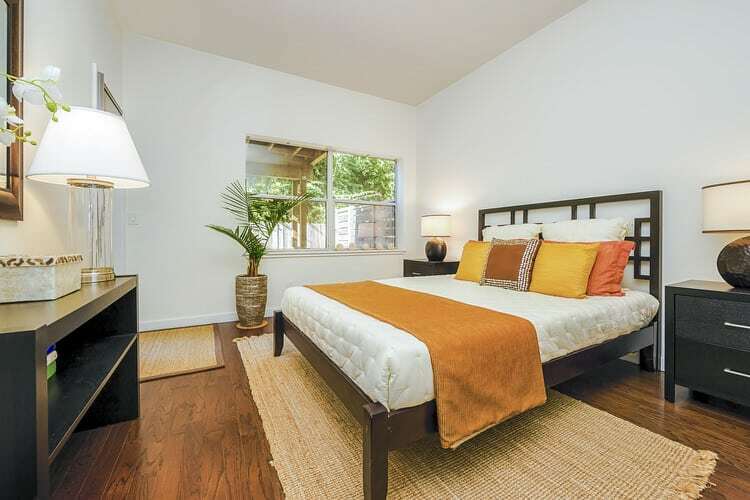 The beige sheets and mushroom fabric walls keep the space from feeling too oppressive. 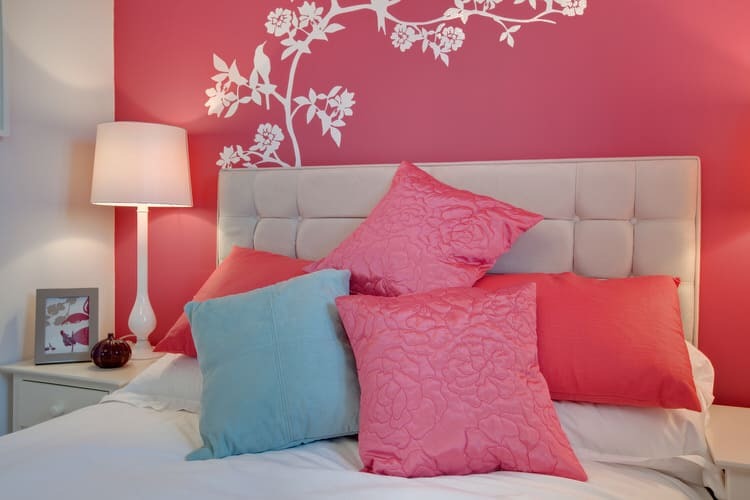 If you are looking to make an eye-catching statement, pick a single color and use it throughout the bedroom. The shade in this space is an icy blue and is repeated in the walls, area rug, throw and pillows. When attempting this color technique start with textiles and then move to your wall paint. Since the advent of paint color matching, it’s much easier to match paint to fabrics and accents than the other way around. A teen’s bedroom in Seattle is painted in raspberry pink because it is in perfect antidote for the city’s rainy and dreary weather. This particular color pink has warm tones versus some pinks, like fuchsia, which has cool blue undertones. The shade of pink chosen by the designer is ideal for this bedroom because it reads hip and vivacious, just like its occupant. A reclaimed wood ceiling sets the tone for a textural hideaway. Pale aqua walls are the canvas for a treasure trove of tropical delights. Ocean blue, driftwood, bamboo and linen are featured throughout this bedroom, adding a richness to the rain forest color palette. 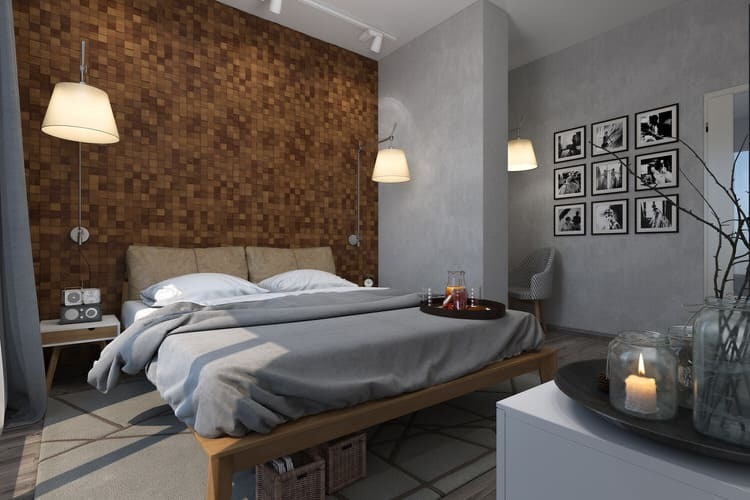 If you like the thought of using multiple colors in your bedroom, but don’t want to spoil the relaxing mood, build a palette with subdued earth tones. Nutmeg walls evoke warmth while sage green and burnt orange bring in just enough color. Dark hues like the deep mahogany furniture add to the color story but don’t compete. Neutral shades of brown ranging from camel to cream to chocolate, allow the pale blue accents and sheets to steal the limelight. When creating a look like this, choose neutrals that complement the main color. 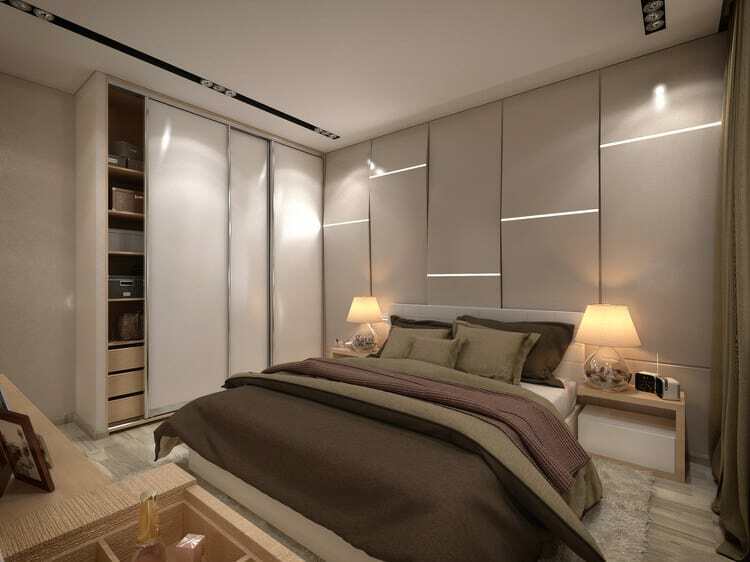 In this bedroom, the walls were painted sandy beige and the furniture, flooring and accessories are organic wood tones. This charming bedroom is a tribute to florals. 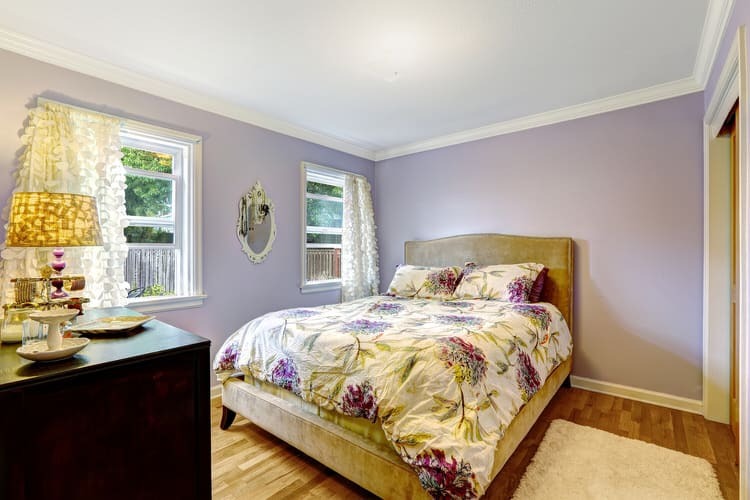 The homeowner painted the walls pale lilac and the trim snow white. The headboard and bedframe are upholstered in light taupe linen. Purple, yellow and cream accents on the dresser echo the colors in the watercolor floral duvet cover and pillow shams. The windows are dressed in burnout velvet curtain panels in a soft ivory. One of the quickest ways to design a colorful bedroom is to begin with your bedding as the foundation for your color scheme. Pull out one color for the walls and the secondary colors for accessories and art. Although this space is brimming with color, you can soften the look by incorporating neutrals. Here’s one way to dream in Technicolor. 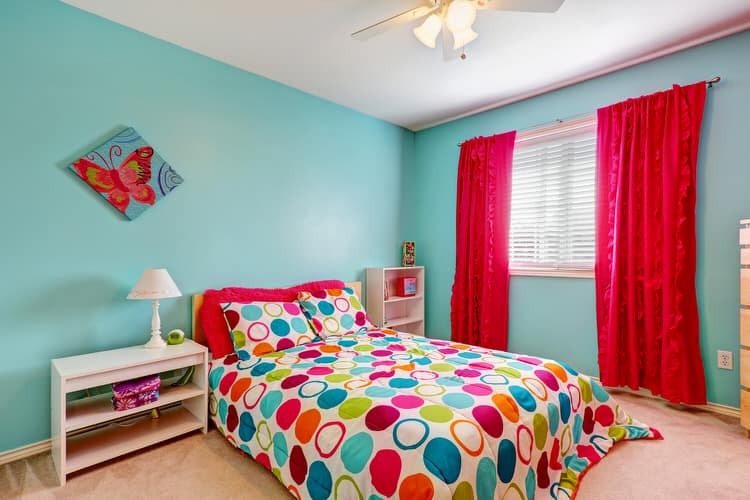 The bright turquoise walls create a lively space in which create, stream a movie, or simply kick back and daydream. 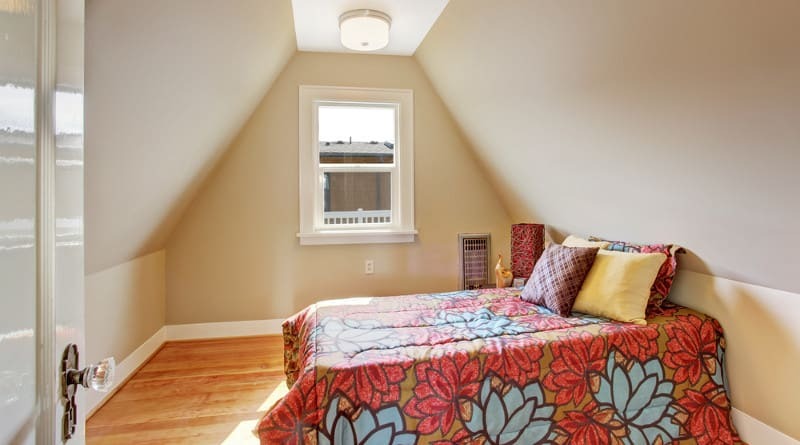 The bedding was a bed-in-a-bag purchase and the butterfly art was a gift from a local artist. We think the bright red ruffled curtains are too cool for school! 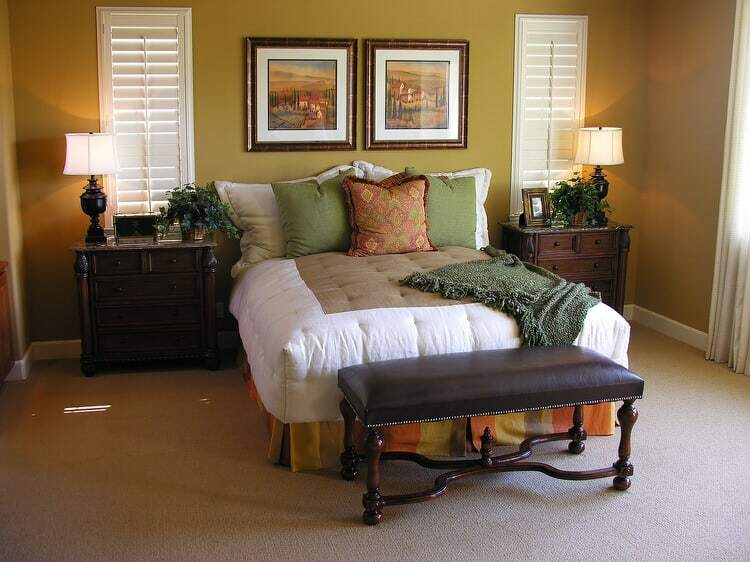 Neutral paint colors are a great choice for bedrooms. Putty color walls give you a blank canvas and let you play with color in your bedding and accessories. 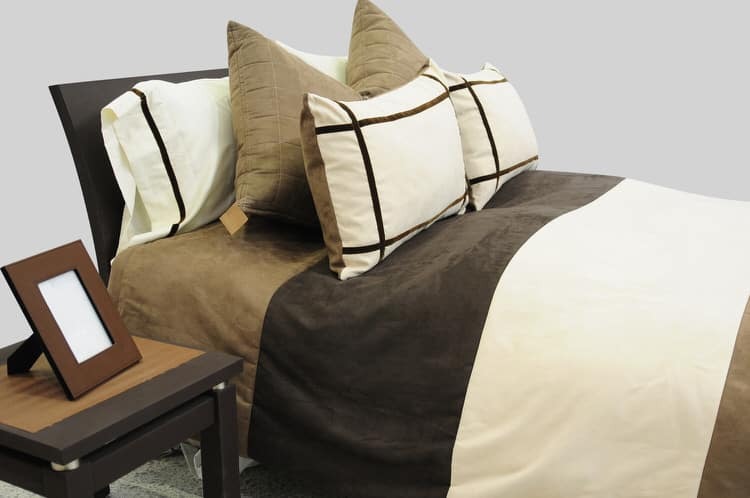 Neutrals also have a soothing quality, which helps you get a good night’s sleep. If you want to add visual interest to your neutral walls, add texture by choosing a different paint finish. 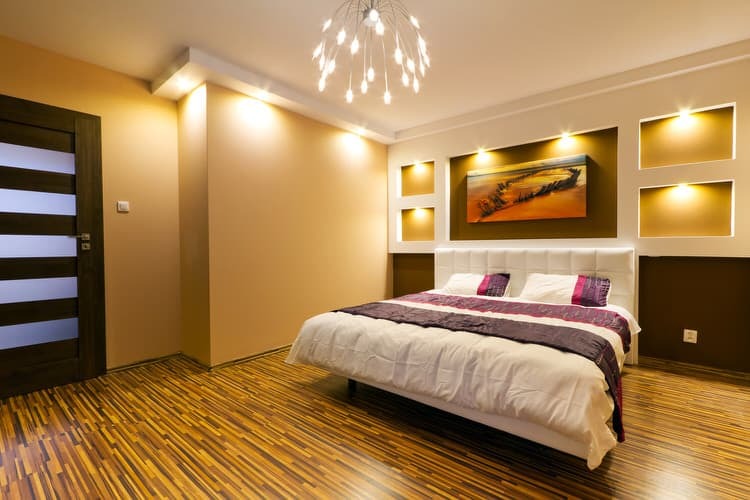 Satin, eggshell, semi-gloss or even a high-gloss will give a neutral wall that hint of glamour. 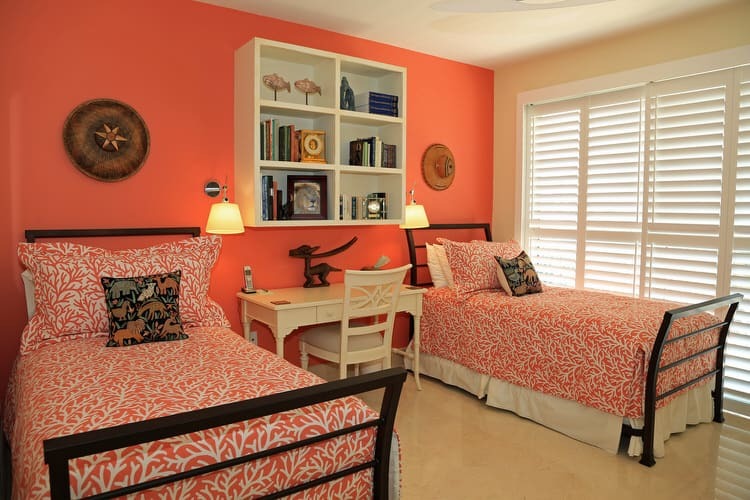 Complementary colors in a bedroom create a bold look, but you can easily tone things down. In this space, the homeowner used a combination of red and blue. 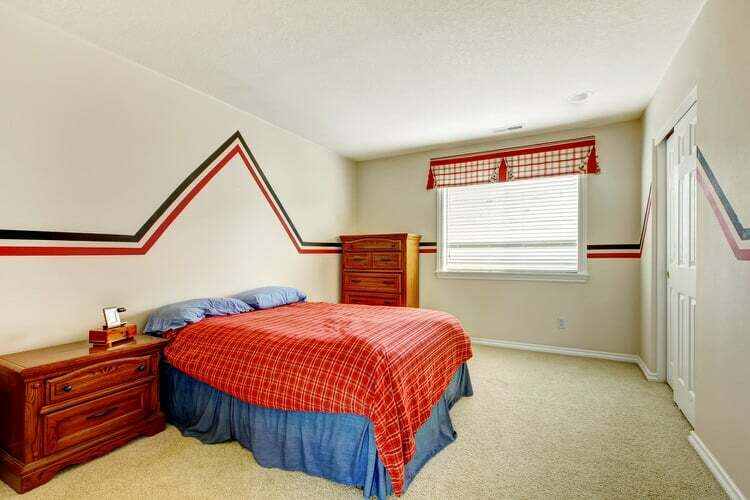 The colors are repeated in the window valance and the horizontal stripes running around the room. The tan carpet and beige walls help calm the space. 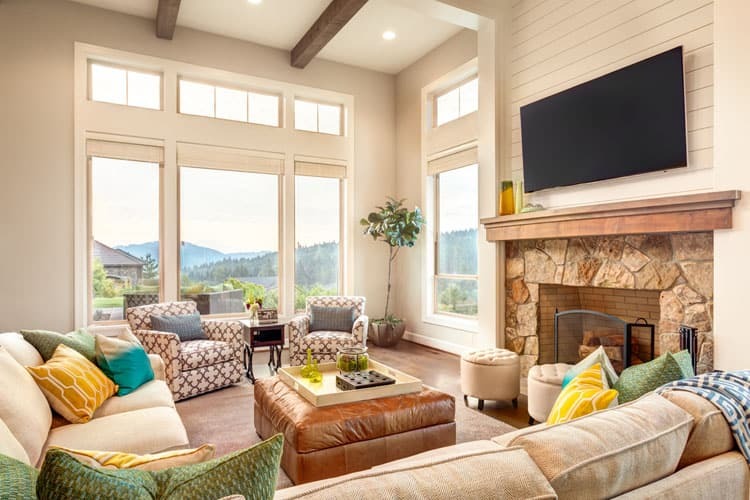 If your taste in interior décor changes as frequently as the seasons, why not think about using a basic color scheme so you can easily follow the latest design trends. 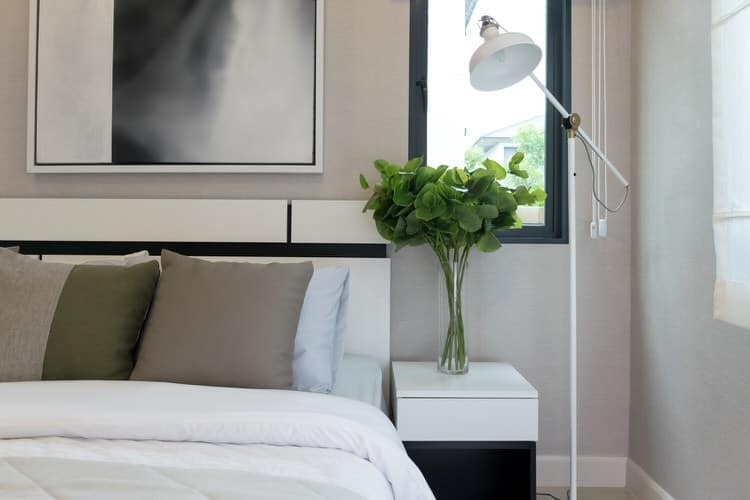 This bedroom uses basic black and white as the foundation. When red is out, it is easy enough to change the bedding and lampshades to your latest color crush. While design trends come and go as quickly as the years pass, classic color duos will always be in style. In this bedroom, the classic pairing of blue and yellow creates timeless appeal. In our example, rich cornflower blue and buttery gold give this venerable combination an elegant and sophisticated feel. 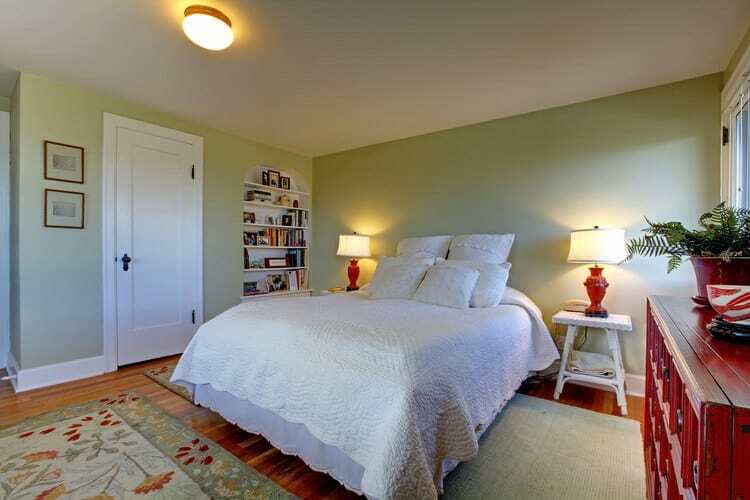 Even a small amount of a lively paint color can invigorate a bedroom. This room doesn’t get much natural light, so the designer used shades of pear to give the space some oomph. 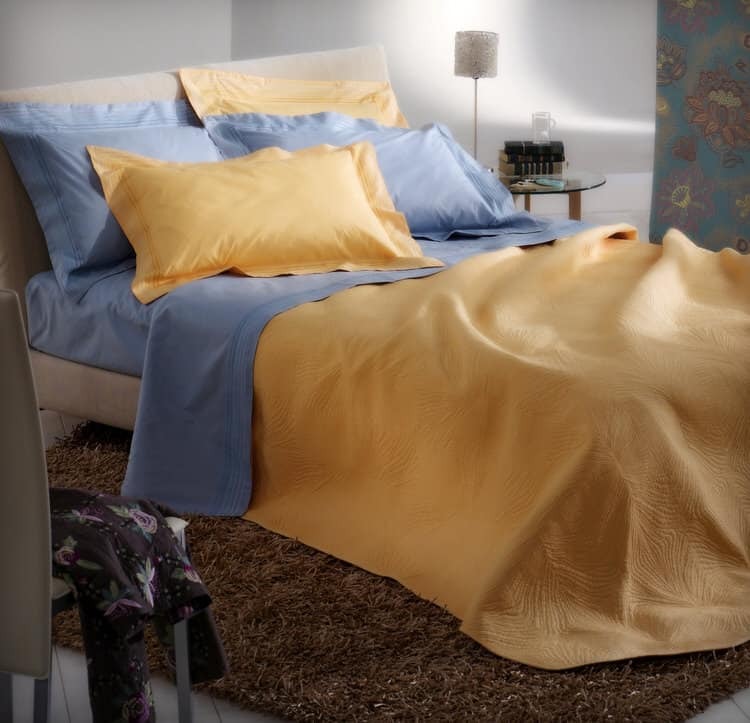 The perky hue is repeated in the bedding and accessories. If you are looking for a bright hue to use in your bedroom, look for paint colors (like this one) which do not contain brown or red. 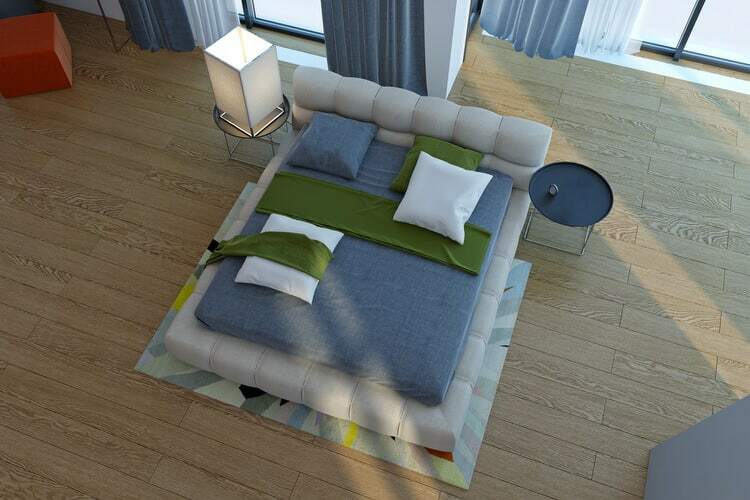 This stylishly modern bedroom uses a fairly unorthodox color combination. The shimmering gold wall is the highlight of the room. The headboard wall features an original painting, which served as inspiration for the space. Surrounding the artwork are framed panels of gold leaf. 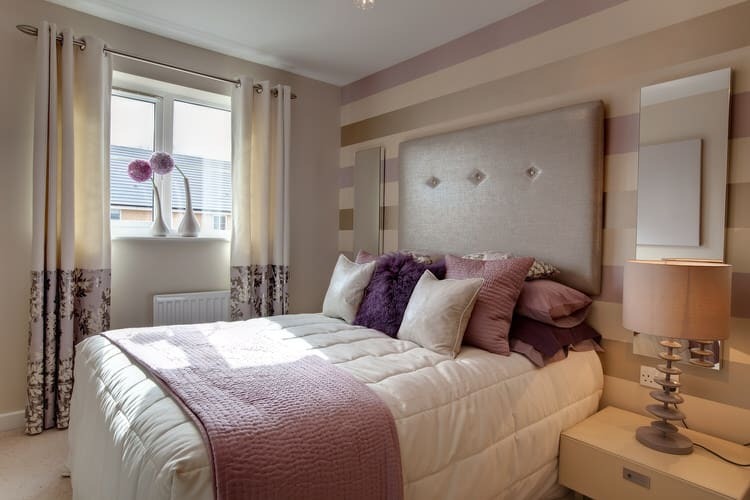 White bedding with wide bands of plum and purple makes an unusual but effective addition to the color palette. Horizontal rose-gold stripes and a tufted headboard provide a focal point of this muted and relaxing bedroom. Shades of of soft rose, lavender and neutrals create the color story for this highly feminine space. Here, a cream duvet is offset with a petal rose blanket to create a subtle and pleasant contrast. The contrast of colors is noticeable, but they don’t detract from the gorgeous textures and materials in the room. If you fall for a wild bedspread full of crazy color, remember to pick a coordinating wall paint for a mod, ultra-cool statement. In this funky bedroom, the bright lavender of the walls was pulled straight from the bedding. To provide a sense of balance, try to use neutrals elsewhere in the room. Muted mint walls and cranberry accents make for an update version of the traditional red and green color palette. This stylish combination doesn’t look the least bit holiday-ish. In fact, it is quite restrained and appropriate for this traditional bedroom. A sophisticated eggplant hue lets this bedroom’s mix of pale bedding, dark furniture and white trim shine. A silk comforter and bed skirt really stand out against the rich focal wall. Remarkably, the deep hue highlights rather than overpowers the delicate bedding ensemble. Neutrals with colorful undertones are a great way to add subdued color to your bedroom. A very light wisteria purple tints the walls. The headboard is a very subtle gray. The satin duvet, lampshades and drapery are all in ivory. Taupes, gray and beige color the bed and accent pillows. Dainty wire lamps complete the elegant, upscale look. For a sharp, contemporary look, choose colors that complement the style of the furniture. Limit your color palette to solids and maybe one pattern. Here, a multicolor accent pillow is front and center, surrounded by solid coordinating colors. A warm orange blanket lies at the foot of the white duvet and white euro shams look neat against the geometric carved headboard. Don’t be afraid of bright white bedroom walls and furniture. However, you need to be prepared to counteract them with color by way of fabric and accessories. In this contemporary grouping, white walls are balanced with blue bedding and a generous area rug. Pops of orange, brown and soft lime round out this mid century modern color palette. 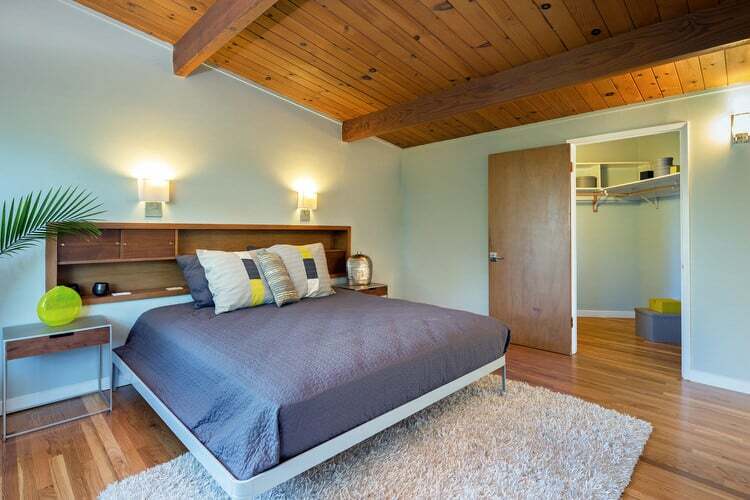 Browns create a bedroom that’s classic, contemporary, and serene. A ribbon grid motif on the pillow shams repeats the shape of the picture frame, side table, and headboard, unifying these design elements. To create a bedroom like this, use a contrasting yet pale wall color like feather gray and balance it with various shades of brown and ivory bedding. Blue and green are a winning color combination since they live right next to each other on the color wheel. Play with intensity, saturation, shade and pattern to create a palette that’s totally unique and perfect for your bedroom. 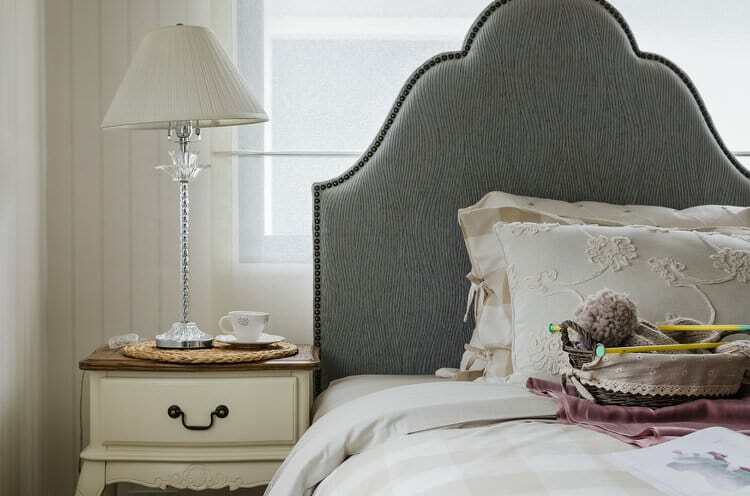 A understated color palette is combined with classic details to create graceful charm in this bedroom. The tall scalloped headboard in rich gray velvet is the perfect topper for the twin bed dressed in an oversized tan and white gingham. The embroidered cream pillow and sham with its delicate ties give the room an appealingly feminine flair. Crystal candlestick lamps are the jewelry in the room. Sail away to your very own beach resort by combining white and sandy beige. The crisp white duvet and antique dressing table make a statement against the off-white walls. 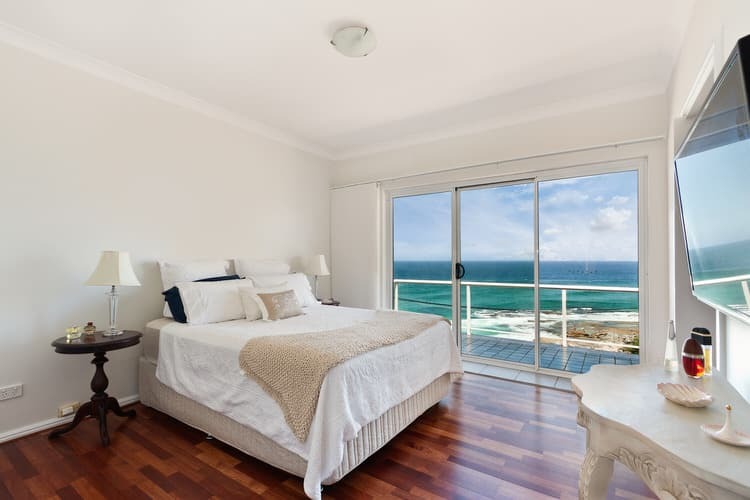 The honey and brown tones of the wood flooring influence the casual seaside feel of the bedroom. The blue shades of the water view emphasize and complete the look. Spa-like perfectly describes this loft bedroom. When asked, more people than not use the term to express the mood they want to create in their personal spaces. In this room, the upholstered headboard and bedframe resemble smooth gray stones. 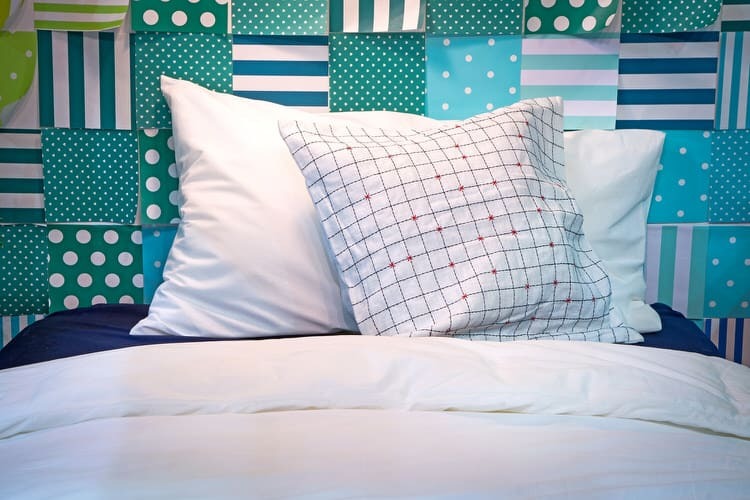 The bedding uses a combination of watery blue, white and deep forest green. 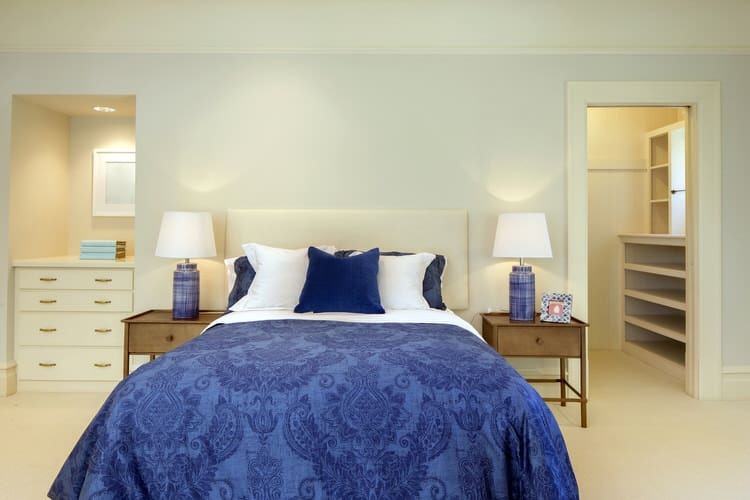 Light wood flooring, subdued lighting and curtains panels borrow the blue from the bedding. The open space radiates a sense of calm and well-being. Achieving this pampered look is relatively simple—get inspired by visiting a nearby spa resort. This bedroom is pretty in soft pink and neutrals. 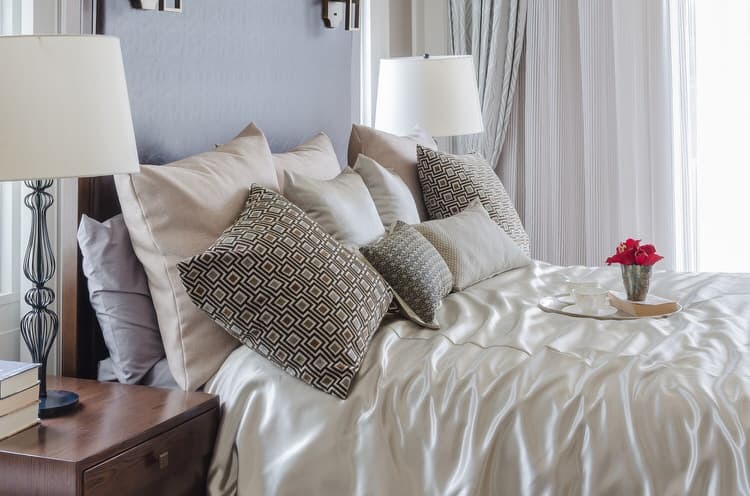 Virtually all of the surfaces and fabrics are done in soothing neutral shades, from the white sheers to the smokey taupe of the bedding and drapery. Actually the only pink in the room is found in the decorative pillows, but the neutral colors in the room give the petal hue a greater visual presence. A white wood-plank wall and beamed ceiling really pops with the addition of apple green paint and accessories. 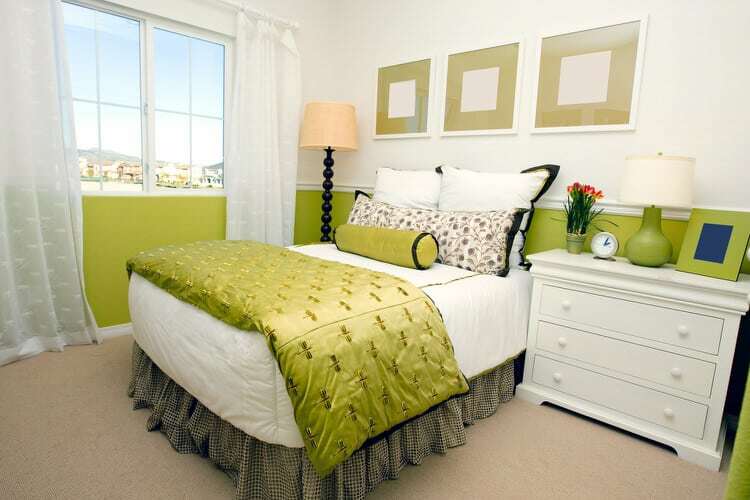 The green wall color complements the playful patchwork quilt and area rug that anchors the bedroom. When you introduce dominant color into a space, don’t forget to balance it with warm neutrals like the traditional furniture and flooring. Moody gray has found its place in the sun as the go-to color for many designers, so why not include it in your bedroom? A several shades of a dusky, medium gray create the ideal setting for this classically masculine design. Furniture pieces are a combination of cool gray and warm wood tones. The real tour de force in the space is the floor to ceiling wall completely covered in wood tile. Baby blue on the walls creates the perfect—and anything but childlike—canvas just ready for a dose of graphic pattern. Black and white bedding with sapphire blue accents spice things up and add lots of dimension to the sparsely furnished bedroom. Simple artwork and a bar cart-turned nightstand are clever additions allowing the color and pattern to take center stage in the space. Be bold and introduce a single splash of color to a tailored, neutral room. Here, red bedding and gingham curtain panels handle the job and transform this bedroom into a warm and stylish respite from the outside world. Barely beige walls and rich flooring contribute to the classic color story.